When I got the call that I'd be working in Winston-Salem from March 2011 to March 2012, I couldn't be more excited. As a native of Charlotte, a 10 year resident of Raleigh, and a frequent visitor to the Wilmington and Asheville areas, the Triad was one locale I had yet to explore. As I get older and travel more and more, I feel like a seasoned ambassador of North Carolina, and this stop in "The Dash" was a memorable one. 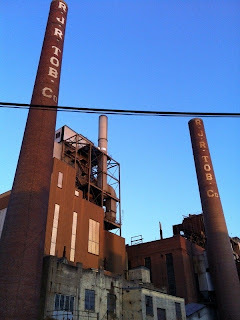 Similar to what I wrote about after my stint in Greenville, NC and my many miles at Umstead Park, here's a small look into what I've picked up on in the past year and what is worth checking out if you ever venture to what was once known as the "Tobacco Capital of the World." This is a place that every town needs. A nice, public rubberized track. You don't have to worry about getting kicked off. You may have to dodge the Reynold High Track team practicing, but they usually stay out of lane one. There's also a nice ~1.25 mile loop around the park that is great for a warm up and cool down. It's right across the street from the YMCA and many group runs start and end here as well. Another plus is that there are tennis courts in the middle of the track that are lit until 8pm or so, which makes night time workouts a possibility (sans head lamp). A beautiful track that is a little softer and nicer than Hanes Park and is easily accessible. The gate is always open, but try to be respectful if the Wake Forest teams are practicing. The track is adjacent to the cross country trails, which makes for a perfect 2 mile warm up and cool down to sandwich a workout. 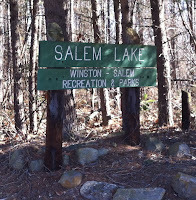 One of the treasures of the Winston running scene is Salem Lake. It's a few miles off exit 195 of Highway 40 and is a nice 7 mile crushed gravel loop that plays host to the Salem Lake Trail Runs (30k and 7 mile). One piece of advice I can give is if you come after work, park in the top lot before the gate, as they tend to lock said gate before the announced times, and I've seen multiple cars get locked in. Otherwise, enjoy the trails and watch out for the mountain bikers! Very close to the Wake Forest campus are the beautiful Reynolda Gardens. There's a nice ~1.5 mile loop that can be configured multiple ways and it's perfect for an easy day. You can park at Reynolda Village and sit outside and grab a bite at the Village Tavern afterwards. I first ran the trails at Wake in high school, competing at the Wake Forest Invitational, and they are exactly as I remembered. The full loop only takes about 10 minutes or so, but you can weave through the multiple options and add it on to the Reynolda Gardens run, which is located about a mile away. They have recently filled in the many eroded areas of the course for better footing. Thinking of buying near Winston? I can help! The thirty five year old club puts on many races in town and has multiple groups that get together for runs as well. They have a nice link for local runs (with distances), that you can often find members of the club running during the week. They put on the excellent Beat the Heat 5k, Ultimate Runner and Frosty 50, that are listed below, as well as many, many other events. Since the closing of 4 Runners Only, Fleet Feet is the only show in town. Conveniently located right across the street from Whole Foods and Yoforia, Fleet Feet has all of your running specialty store needs and a nice staff that will put you in the right shoe. A favorite of mine since my early days in Charlotte, Omega is a great place to catch a deal, as they always have coupons (join their email list). A nice staff and a nice selection make it a great place to pick up a pair of shoes or some gear. This is the NC USATF 5k Championship and is an overall awesome race. I ran this in 2010, before knowing I'd spend a year here, and raved about it then. Any race that has free beer, free pizza and free subs post race is good in my book. A challenging course and great competition makes it worth the trip. They also do an interesting "age-graded" award system, which is becoming more generous to me as I get older. It's also held at night, which is a nice change of pace, especially in the Summer! One of my favorite running events, period. And I've only done it once. It's a decathlon of sorts where you run the mile, the 400, the 800, the 100 and then close it out with a 5k tour of Hanes Park. It's limited to 108 runners, which are divided into 8 heats. You're given points for your place in each event and like golf, low score wins. The event is followed by an awesome after-party, put on by Twin City TC, that includes free beer and pizza. A must do! A staple in Winston is the Mistletoe Run, which is a Half Marathon. 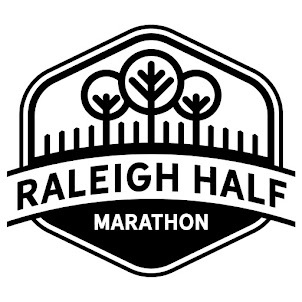 The race starts by Hanes Park and offers some challenging hills and a very scenic course. It's generally held after Thanksgiving, during the first weekend of December and there is a 5k and Fun Run option if you're not looking to go the 13.1. I've yet to run this one, but my sources unanimously recommended it (and they're natives). 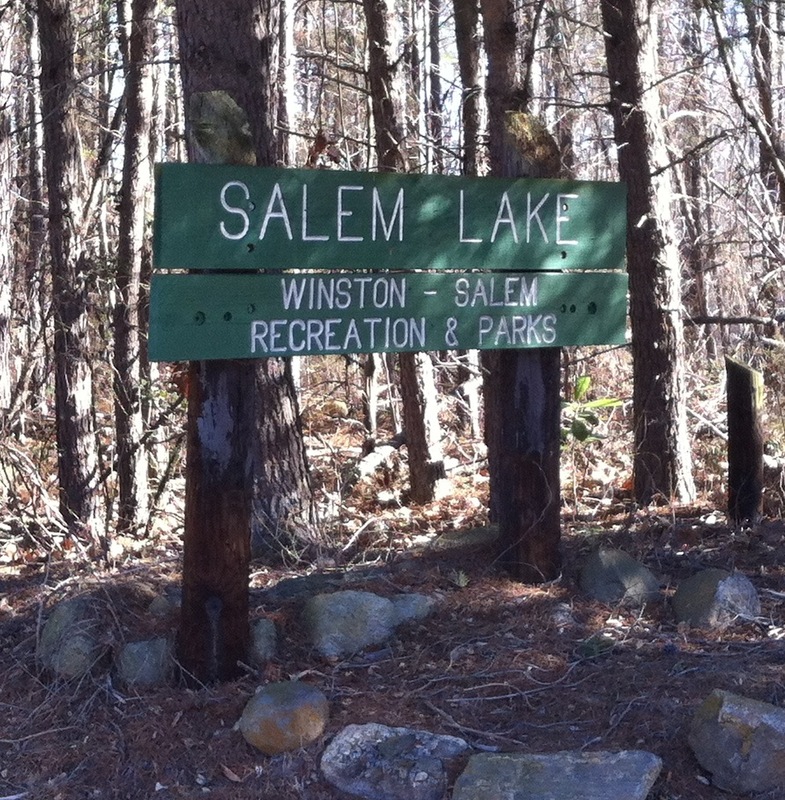 The Frosty 50 is a 50k that's held around the first Saturday of the year at Salem Lake. Don't want to run a 50k? There's a 25k option and a 4-man relay as well. Like beer? Me too. 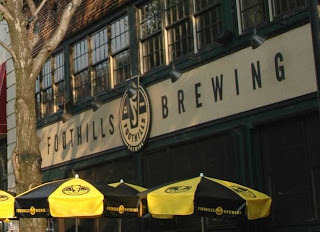 Not only does Foothills make award winning beer, they have an excellent brewpub where you can get cheese grits as a side item. They also have trivia, music and plenty of TV's to watch sporting events. And if you're anywhere in NC, order a Hoppyum or a Sexual Chocolate (if you can find it). You won't be dissapointed. My favorite restaurant in Winston. If you can only go to one place to eat, this is the spot. 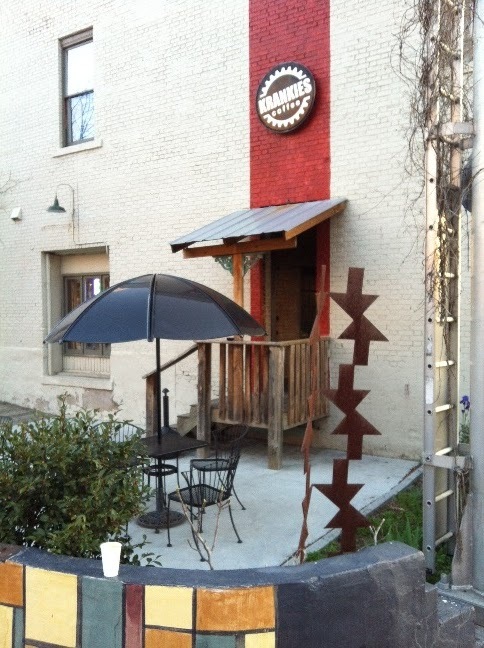 Great apps and entrees and a nice setting near downtown Winston makes this a hot spot. Try the gourmet bacon-wrapped meatloaf with cheese grits (yes, I love grits) and spicy collards. Delicious! A very cool coffee spot that I was only introduced to recently. They've got a great vibe here with plenty of indoor and outdoor seating. Food, coffee, beer. You know, the works. 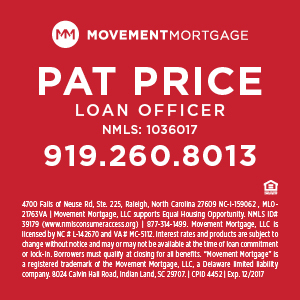 Eddie Wooten writes an excellent blog for the Greensboro News & Record that covers the running scene throughout the Triad. A definite bookmark for keeping up to date with local races and news about local athletes performing on the national level. Winston's first indoor track opened this year. Local builder and excellent runner, Craig Longhurst, has mixed business with pleasure and developed a spot to host high school. college and even masters meets. This has filled a big void in the state, as last year there wasn't a place to host the high school state meet. Thanks Craig! An excellent movie theater that shows the films that will be nominated for Oscars. Also, the host of the River Run Film Festival. A great place to see a film before a night on the town, as it's located right on the heart of 4th Street. Also, they serve beer and wine. If you're into Ultras and mountain running, Pilot Mountain is just a short drive from Winston and hosts this excellent event. They also have the Pilot Mountain 5k Challenge if you don't want to go long. Two of Winston-Salem's finest exports! This was orginally posted in March 2012. 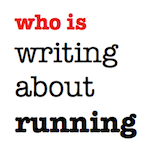 My hope is that when people google "Running in Winston-Salem, NC," that they will find this post, so if there are any additions I am missing, or things change in the future, please email me and I will revise accordingly! 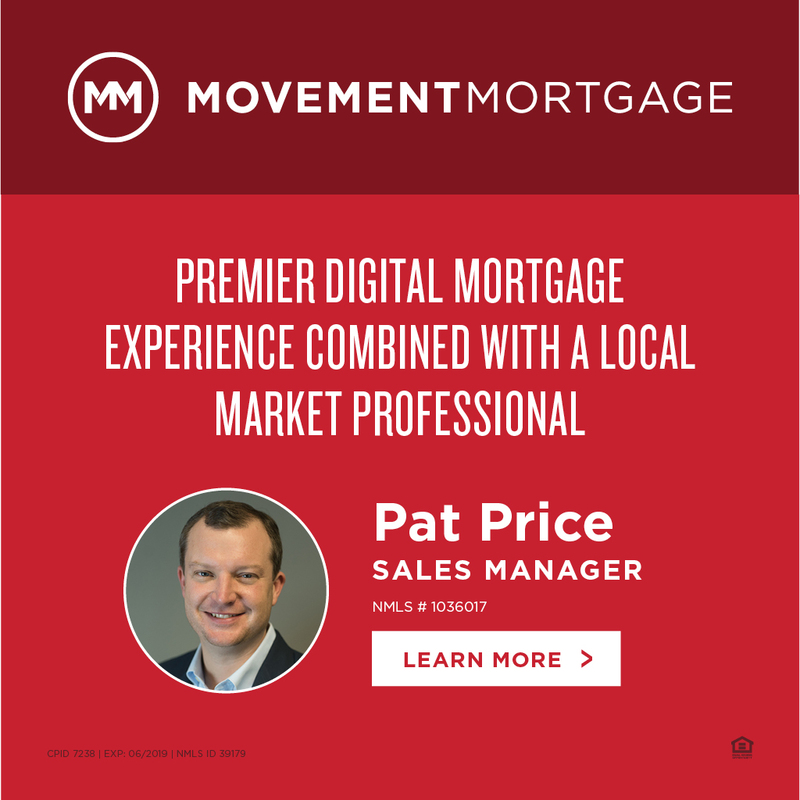 Thanks to Brian Amrich, Nick Iauco and Molly Nunn for help compiling the information! And thanks to the good people at Wake Forest Baptist Health for providing an excellent place to work! Thanks to our sponsor, Race Ready, for sponsoring the blog this week.Great running shorts to store your PowerBar gels! 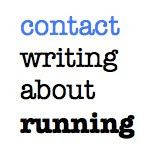 If you're interested in sponsoring writing about running (and other great sites like TrackFocus, Track Superfan, Paul Merca and the House of Run podcast) in the future, check out The Relay Network. I am sad that I 'm moving away from Raleigh just as you're coming "back." Boo! Thanks for writing this - I just moved to town and will be using this to guide some of my runs and eats around town! One trail suggestion that I loved when I lived there was Hobby Park. They have a 6.9ish mile mountain bike trail that's pretty rugged and fun the brunch on. Also Tanglewood Park in nearby suburb of Clemmons is a great place to run. Good mix of man bike and horse trails in the shade of some big pines.